How Many Calories in a Bowl of Potato Soup? Potato soup is typically a cream-based soup and can include additional ingredients such as leeks, bacon and cheese. 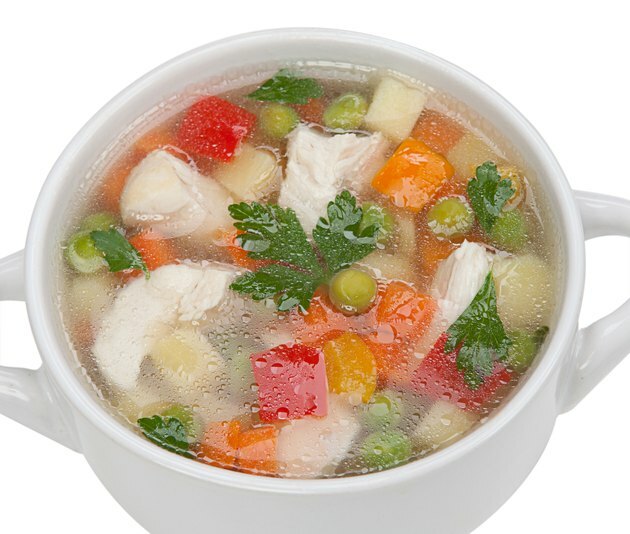 The more high-calorie ingredients in the soup, the higher the soup's overall calorie content. Using chicken broth and pureed potatoes instead of cream can lower the calories in your soup, as can limiting or eliminating high-calorie add-ins like cheese and bacon. If you make canned condensed potato soup with milk, each cup has 149 calories. Use water instead, and you'll reduce the calories to 73 per cup. Potato soup from a restaurant has around 190 to 210 calories per serving. Potato soup made from scratch at home can vary greatly in calories depending on the recipe you choose. A recipe made with bacon and slightly less than 1/2 cup of cheddar cheese per cup of soup has 430 calories per cup. A similar recipe made without the bacon and cheese has about 170 calories per cup. You can further reduce the number of calories by using cauliflower in place of half of the potato, resulting in a recipe with about 91 calories per cup.